Sorry I have not updated this blog for sometime. I have not been cooking lately until yesterday. Anyway, I am fond of vegetables particularly broccoli. It’s a highly nutritious vegetable from the cabbage family. There are many ways of cooking it. 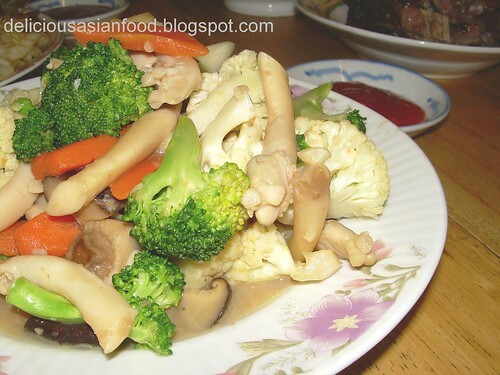 Here, I will share with you how it is stir-fried with other vegetables chinese style. Heat oil in wok till oil starts to smoke. Add garlic and mushrooms. Stir fry for 1 minute. Add cauliflower, carrot, asparagus clams and baby corn. Continue to stir fry for 3 minutes, adding hot water gradually. Cover for 1 minute. Add broccoli and continue to stir fry. Add a little bit more of the hot water if it becomes too dry (you will want a little bit of sauce). Add flavouring above and continue to cook until broccoli is slightly limp. If the sauce is too watery, add a little bit of the corn starch to thicken the sauce. Serve hot with preferably with rice.